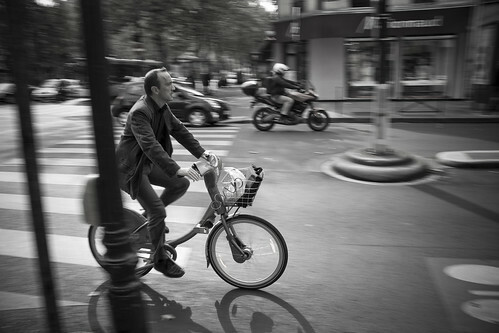 I rode around Paris in the middle of the day. I know that in the mornings there are more people cycling to work, including more 'cyclistes sportifs'. 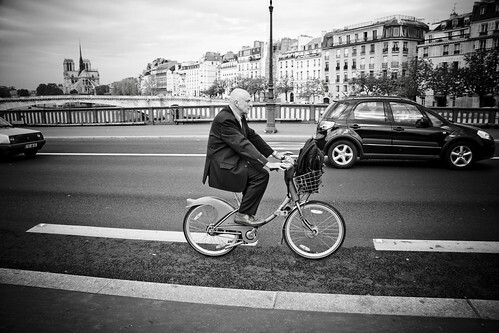 But during the day it really is amazing to see great numbers of, not least, well-dressed gents on Velib bicycles or their own. There is no age or wage restriction. There are studenty types and frightfully elegant older chaps in frightfully expensive shoes. Most are riding alone - transporting themselves quickly from A to B in the city which is the whole point really, but some ride together. 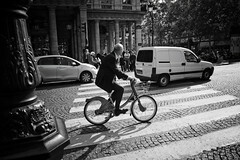 Paris really has this Bicycle Culture 2.0 figured out. This chap was with, I assume, a colleague. 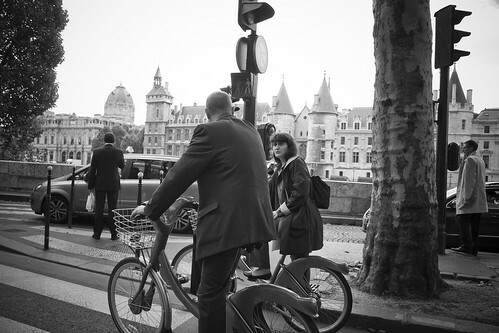 They were chatting avidly in the dense, almost stationary, traffic along the Seine. Just a part of the traffic equation. We were in a bus lane at this point, which cyclists can share if there isn't separated infrastructure. Ahead of us the traffic was immobile. The bus behind us dinged at us - the busses have cute little electronic dings that sound like bike bells! - and we all turned to stare at the bus driver. There was nowhere to go, not even room for a bicycle to squeeze through the merging car traffic. He just shrugged Gallic'ly, as did we. When a hole opened up, the bicycles zipped through it, leaving the bus behind. One more time nice shots ! But Paris should deserve colors pics, the weather is so nice and hot these days: l'été indien. 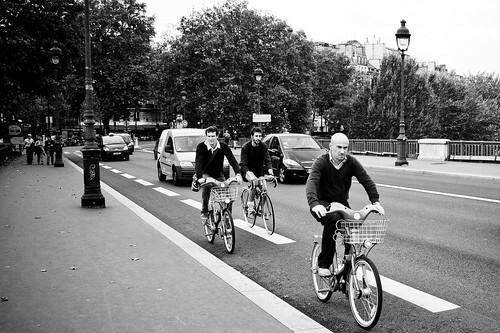 By the way, we say "les hommes de Paris" ! why vélibs only ? we have some pretty good-looking bikes running around this city too!